What does OSHA mandate in regard to worker safety? Infectious waste is a special class of waste found primarily in health-related industries. In Statute 116.76, the State of Minnesota defines an infectious agent as an organism that is capable of producing infection or infectious disease in humans. This MnTAP page offers basic definitions and information on different types of infectious wastes, information on how to safely manage your infectious wastes, and resources and suggestions on how you can make environmentally preferable decisions regarding your infectious waste stream. You may also want to visit the MPCA factsheet Infectious Waste Management Guide for Generators for additional guidance on this topic. meaning waste human blood and blood products in containers, or solid waste saturated and dripping human blood or blood products. 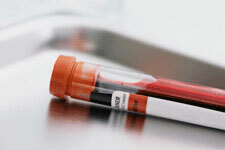 Human blood products include serum, plasma, and other blood components. meaning waste cultures and stocks of agents that are generated from a laboratory and are infectious to humans; discarded contaminated items used to inoculate, transfer, or otherwise manipulate cultures or stocks of agents that are infectious to humans; wastes from the production of biological agents that are infectious to humans; and discarded live or attenuated vaccines that are infectious to humans. meaning human tissues and body parts removed accidentally or during surgery or autopsy that are intended for disposal. meaning cerebrospinal fluid, synovial fluid, pleural fluid, peritoneal fluid, pericardial fluid, and amniotic fluid that are in containers or that drip freely from body fluid soaked solid waste items. meaning carcasses, body parts, and blood derived from animals knowingly and intentionally exposed to agents that are infectious to humans for the purpose of research, production of biologicals, or testing of pharmaceuticals. meaning (1) discarded items that can induce subdermal inoculation of infectious agents, including needles, lancets, scalpel blades, pipettes, and other items derived from human or animal patient care, blood banks, laboratories, mortuaries, research facilities, and industrial operations; and (2) discarded glass or rigid plastic vials containing infectious agents. Statute 116.78 requires that all generating facilities properly manage their infectious waste. Guidance on the management of different types of infectious waste can be found under the topic headings below. Note that you must use an infectious waste disposal company that is compliant with all Federal Motor Carrier Safety Administration (FMCSA) rules on Hazardous Materials Regulations and that is registered with the MPCA. Though MnTAP cannot offer any endorsements of transport and disposal companies, you can find more information about the requirements for infectious waste transporters by visiting the MPCA factsheet Infectious Waste Management Guide for Transporters. Going a step further, Statute 116.79 requires all facilities that produce infectious waste in Minnesota to have a management plan (i.e. a policy) in place for managing their waste. Smaller facilities are required to have a policy in place that includes the names of all who generate the waste; hospitals and laboratories simply need to provide a bed count or the number of generating employees. It is worth noting that relevant staff must receive annual training on the disposal of infectious waste, including proper precautions and worker safety; more information on worker safety is in the OSHA and worker safety section below. Anyone who is signing the infectious waste shipping manifests (similar to the hazardous waste manifests) must also have DOT “hazmat” training at least once every three years. Templates and training documents pertaining to the infectious waste stream can be found under our Waste Training Toolkit. According to the Occupational Safety & Health Administration (OSHA), employers must ensure the greatest possible protection for employees in the workplace. OSHA maintains that the cooperative effort of both employers and employees will help establish and maintain a safe and healthy work environment. In the healthcare sector, this includes preventing worker exposures to blood, body fluids, and infectious diseases by way of contact, droplet, or airborne transmission. More information on infection prevention can be found on MnTAP’s Infection Prevention, Disinfection, Sterilization, and Green Cleaning webpage. When considering infectious waste, bloodborne pathogens are a main concern. OSHA defines bloodborne pathogens as infectious organisms in human blood that can cause disease in humans. They include, but are not limited to, hepatitis B (HBV), hepatitis C (HCV), and human immunodeficiency virus (HIV). Visit OSHA’s resource on Bloodborne Pathogens for more information on this topic. You can also read the Most Common Hazards in Healthcare checklist, updated annually, which is based on the most cited violations in healthcare and what facilities can do to be better prepared for an OSHA inspection. Infectious waste and hazardous waste are not synonymous. This is one of the most common mistakes made concerning healthcare wastes. For example, a facility may believe it is following the law by placing unusable medications into a red bag or sharps bin, but this is untrue under all circumstances. The infectious waste stream is intended for biohazard burdens, such as blood and body fluids, and this waste is often autoclaved (steam sterilized), compacted, and sent to a special landfill. The chemical properties of RCRA hazardous waste are not eliminated by the autoclaving process; autoclaving is an inappropriate and ineffective method for treating RCRA hazardous waste. Regulators will be diligent in the inspection process to ensure that you do not have medication waste leaving through your red bags or sharps bins, so it is critical that you understand the difference and manage your program accordingly. There is, however, one situation where a waste can be “dual” waste (both infectious and hazardous), and it is discussed below. For more information on RCRA hazardous waste specifically, please visit the healthcare hazardous waste section of this website. Biohazard infectious waste, or regulated medical waste, is commonly called “red bag waste” in healthcare. Red bag waste is appropriate for (1) blood waste, (2) laboratory waste, and (3) regulated human body fluids as described in Statute 116.76 above. The primary treatment for this waste is autoclaving (sterilization) at a licensed disposal facility. Oftentimes this waste is compacted and sent to a special landfill. Red bags are NOT appropriate for wastes that must be incinerated, such as healthcare hazardous waste, chemotherapy waste, or pathological waste. Facilities often end up with more waste than is necessary in their red bags. This is undesirable for many reasons, including increased costs and an increased environmental footprint associated with this waste stream. For more information on this topic, please visit environmental best practice for managing infectious waste below. Needles and sharps are a subtype of biohazard infectious waste and are commonly just called “sharps” in healthcare. Sharps waste is appropriate for (1) discarded items that can induce subdermal inoculation of infectious agents and (2) discarded glass or rigid plastic vials containing infectious agents as described in Statute 116.76 above. “Sharps” are so named because they have a projection capable of piercing the skin and thus the potential to infect someone with blood or another infectious agent. Facility staff often throw medication vials (either empty or full) into the sharps waste stream. This is an undesirable practice because, sharps are not incinerated; they are autoclaved (sterilized), which is not an appropriate treatment for medication waste. Medication vials must be treated in the RCRA hazardous waste stream. For more information on pharmaceuticals and medication waste please visit our healthcare hazardous waste webpage. On a final note, needles and needlesticks are of great concern for any healthcare worker. OSHA guidelines on bloodborne pathogens offers the following caution to all healthcare workers: “If you are stuck by a needle or other sharp or get blood or other potentially infectious materials in your eyes, nose, mouth, or on broken skin, immediately flood the exposed area with water and clean any wound with soap and water or a skin disinfectant if available. Report this immediately to your employer and seek immediate medical attention.” Refer to what does OSHA mandate with regard to worker safety for more details. Yellow bag waste is appropriate for (1) pathological waste, meaning human tissues and body parts removed accidentally or during surgery or autopsy and intended for disposal, and (2) research animal waste, meaning carcasses, body parts, and blood derived from animals knowingly and intentionally exposed to agents that are infectious to humans, as described in Statute 116.76. It should also be noted here that the preferred method of treating trace chemotherapy waste is in the yellow bag waste stream, because the chemical properties of chemotherapy drugs can only be destroyed via incineration. More information on the treatment of chemotherapy wastes in the yellow bag waste stream is found in the cytotoxic drugs and chemotherapy waste section of this webpage. Facilities typically won’t need to have yellow bag waste containers in as many locations as they do red bag waste containers; however, oncology units and clinics, as well as laboratories dealing with human or animal tissues, must pay close attention to ensure that these types of wastes are being disposed of in the yellow bag waste stream (not the red bag or other waste stream). More information on how to manage your yellow bag waste stream can be found on the MnTAP webpage Waste Training Toolkit. Dual waste is a special class of waste because it is both infectious waste and hazardous waste. For example, let’s say you administer an influenza vaccine via injection, but the patient becomes squeamish and you withdraw before completely administering the dose. Now you have a sharp (infectious waste) that contains an unusable portion of influenza vaccine (a RCRA hazardous waste). The law states that you must now throw this sharp into a third waste stream, called dual waste. This is a very special situation and some sites may find they generate more dual waste than others. If your facility does generate dual waste, it is prudent for you to segregate this material from any other waste stream. If you have your staff throw dual waste into the RCRA waste boxes, it will vastly increase the cost of your RCRA waste stream. It will also put the RCRA waste disposal company employees at risk for needle sticks. Thus, you should make every effort to properly label your bins so that sharps never end up in your regular RCRA waste stream. For more information on dual waste, visit the MPCA factsheet Regulatory Consensus on Health Care Issues. Antineoplastic agents (cancer chemotherapy drugs and cytotoxic drugs) can have adverse impacts on both the environment and the people who administer them (patient care providers). Antineoplastic agents should never be thrown into a landfill, and you should ensure that they are disposed of in a waste stream that will be incinerated. In healthcare, there are two waste streams that are incinerated: RCRA hazardous waste and the infectious “yellow bag” waste stream. The RCRA hazardous waste stream is appropriate for bulk chemo waste, and the yellow bag waste stream is appropriate for trace chemo waste. Bulk waste includes any amount of antineoplastic agent that could drip, pour, or be wrung from its host. For example, if you had a spill of these drugs, everything that was used to clean up the spill would be considered bulk waste. In addition, if you do not back-flush your IV sets after administering chemotherapy, the IV bag and tubing would be bulk waste. Any direct free-flowing amount would be considered bulk as well. Bulk chemotherapy waste should be managed in your RCRA hazardous waste stream, such as your black box. Take care to ensure that your bulk chemotherapy waste is contained in a tightly closed container and that as few people as possible are exposed to the contents. Visit MnTAP’s healthcare hazardous waste page for more information. Trace waste includes anything that was used in the administration of antineoplastic agents, such as disposable gowns and gloves used by the staff, and the back-flushed bags of infused chemotherapy. Trace waste is properly managed in the “yellow bag” waste stream. Yellow bags indicate that the final disposal method will be incineration (as opposed to a red bag, which indicates that the waste will be autoclaved (steam sterilized)). A yellow bag waste stream is handled by an infectious waste vendor, and more on this topic can be found in the pathological and large tissue (yellow bag) waste section of this webpage. Though it is beyond the scope of this document, readers should be aware of the occupational dangers associated with exposure to antineoplastic agents. Personal protective equipment should be worn by all who may come into contact with these products, including not only the patient care provider (such as the nurse administering the product), but also housekeepers, laundry workers, and waste handlers. Healthcare workers’ exposure to antineoplastic agents has been linked to adverse reproductive outcomes, chromosomal damage, and other effects. It is especially important for pregnant workers to be properly protected from antineoplastic exposure. 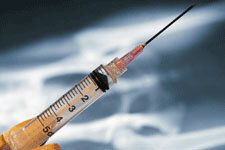 For more information visit the CDC/NIOSH website on occupational exposure to antineoplastic agents. According to Minnesota law, all hospitals must accept infectious waste from the following locations: licensed ambulance services, public school health services, eligible boards of health, eligible community health boards, and eligible public health nursing agencies. Hospitals and other healthcare facilities are not required to accept infectious waste from patients or individual households. They can accept these wastes from patients and households as long as they (1) don’t accept it from other businesses or government agencies, (2) notify participants that pharmaceutical waste is not allowed, and (3) keep the waste segregated until ready to ship off-site. For more information on accepting infectious waste from outside your healthcare facility, visit the Infectious Waste Management Guide for Generators. As an alternative, the MPCA offers guidance for individual households on proper management of infectious waste, in particular needles and sharps (households are exempt from other regulated medical waste rules). For more information, visit the MPCA webpage for households, Disposing of Needles and Syringes. It is not uncommon for there to be confusion about what is and isn’t considered infectious waste. This often leads to extra waste being treated as infectious. Body fluids that are exempt from the regulated waste rules include mucus, saliva, vomit, urine, and feces. Teeth are also not considered to be infectious waste (as long as they are not dripping with blood). Finally, the MPCA makes a clear distinction that blood-stained items that “will not release blood or body fluids when compressed” are not considered infectious waste. Therefore, items such as gowns, exam gloves, minor dressings, adhesive bandages, bedding, and sheets that may have blood staining on them, but would not release blood when compressed, should not be treated in your infectious waste stream. Over treatment of waste is expensive and taxing on the environment: trucks come more frequently to your facility, you use more bags and containers, and the disposal company exerts copious amounts of energy and water treating the waste you’ve sent them. If it doesn’t need to be in a red bag, it shouldn’t be in a red bag! Furthermore, you may find opportunities to recycle some of the wastes currently in your red bag that don’t need to be, such as sterilization blue wrap. It is common for facilities to want to put red bag containers in several areas. After all, in healthcare, don’t they belong everywhere? The answer to this is generally no. Regular patient rooms, exam rooms, nursing stations, and the like typically do not need access to a red bag waste stream. Focus your efforts on places likely to generate this waste, such as operating rooms, procedure rooms, and clinical laboratories. Items such as exam gloves, minor dressings, and adhesive bandages are not usually considered to be infectious waste, and there is no reason, as we saw in Recommendation #1, to over-treat your waste. Filling containers until full is less wasteful than tying off very large red bags that are only partway full. If you aren’t producing enough waste in one area to fill a bag each day, consider switching to a smaller container with a smaller bag to save money on bags and reduce plastic waste. If you are using a 55-gallon bag in a small procedure room, you could probably downsize. Furthermore, smaller bags have the advantage of being removed more frequently, reducing odor issues. Remember to leave room to tie off your red bags according to your disposal company’s requirements. If your infectious waste disposal company is coming to your site more than once per week, this is likely too often. You can save costs and reduce your carbon footprint associated with trucking by reducing your pickup frequency. Oftentimes, with proper storage practices, one pickup per week or less is sufficient for facilities large and small. Discuss your pickup schedule with your infectious waste disposal company. It is far too common for facilities to use red bag containers as the regular trash, especially in places like operating rooms and procedure rooms. It is not uncommon to find wrappers, paper towels, exam gloves, and even pop cans in an infectious waste bin! Make sure your staff understands what the infectious waste stream is to be used for, and ensure they are not using it as an open trash can. This is not only environmentally preferable, but will also reduce your costs. There are a few companies in Minnesota who provide reusable containers for collecting sharps. These containers are removed as-is once full and transported to the infectious waste disposal company. The containers are then emptied, sterilized, and returned to the stock of “usable” sharps containers. 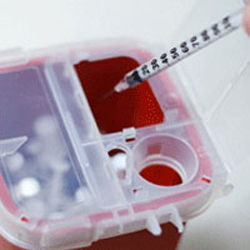 Reusable containers for sharps are preferable to disposable because there is much less plastic waste involved; the reusable containers can sometimes be washed hundreds of times or more before they are unfit for recirculation. Ask your infectious waste disposal company if they offer this service. If they do not, ask others in your healthcare network which companies they are using for reusable containers. Suction canisters are used in operating room settings, such as in hospitals, surgery centers, and other places where large-quantity suction of blood and body fluids may be necessary. Implementing a system that uses reusable canisters, or, better yet, is plumbed directly to the sanitary sewer, can help reduce the amount of infectious waste your facility generates. MnTAP performed an several years ago on the benefits of eliminating a disposable suction canister system. Several companies now sell technology that allows you to process and treat infectious red bag waste at your site and then divert those wastes to your regular waste hauler. This is a relatively new idea to the healthcare industry, but some sites, particularly hospitals, are finding success with it. An article in Health Facilities Management magazine, Treating Regulated Waste, may help clarify the process and help you decide if it is something worth exploring at your facility.